Details on custom cards are slowly coming through. Nvidia has finally lifted the lid on the GeForce GTX 1080 Ti, and what a monster it looks set to be. Faster than the Titan X at a much lower price sounds like a great deal to us. Plus, it's forced prices of the GTX 1080 down, making a hugely powerful card much more affordable. Now we get to see what all the custom card manufacturers have in store for us, and Nvidia also revealed the Founders Edition will have the same MSRP, $699, as custom cards, which is a switch up from what happened with the 1080/1070/1060. Asus has a few 1080 Ti cards coming with a couple being added to its line of RoG Strix products. The Asus GTX 1080 Ti Strix Gaming and the Gaming OC come with the manufacturer's triple fan DirectCU III cooler plus a backplate. The Asus GTX 1080 GTX Turbo comes with what looks like a standard blower cooler, and will likely have similar specs to the Founders Edition. Currently Zotac has announced the GeForce GTX 1080 Ti PGF (Prime Gamer Force) Edition. Here's another card with a new triple fan cooler, and on top you'll find two 8-pin power connectors. Plus, Zotac has a Founders Edition coming too. MSI has its own Founders Edition on the way, but it's got the GeForce GTX 1080 Ti Gaming X coming very soon too. This one's got a dual fan Twin Frozr VI cooler, and RGB LEDs if you're looking to spice up the inside of your PC. Again, expect a Founders Edition card to be sold by EVGA, along with some custom cards. Right now the manufacturer has announced the GTX 1080 Ti FTW3 with its custom iCX Cooling Solution. It's a massive three 100mm fan design, and there are all sorts of fancy sensors to keep an eye on internal temperatures. Inno3D laughs in the face of your triple fan cooling solutions. It has a GTX 1080 Ti coming with the iChiLL X4 quad fan solution, with three big fans on the front, and a smaller one on top. 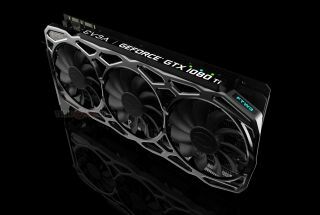 Colorful has now announced its own GTX 1080 Ti Founders Edition, which it says will be available on March 10. Plus, custom design Colorful cards will be following soon after. As for the other manufacturers, the likes of PNY, Palit, KFA2, Gainward, Gigabyte, and GALAX all have Founders Edition cards on the way, with no custom cards announced as of yet.